Looking at a body of work is like looking at a person. As the acquaintance (or viewer) you are given clues about the person but without context, you’re shown their present with no sense of the past, and it’s up to you to piece it all together into one sum of a human. Kim Rae Taylor, the artist at hand, presents us with this very experience in her oeuvre Happy Limbo of Suspended Metaphors. A strikingly personal body of work, Taylor offers her viewers not only a look into her process as an artist, but her pilgrimage that follows suit. She positions herself as both observer and author, while invariably finding sanctuary as a dreamer. May I See Your I.D? Inherent in any piece of work is the maker and the makee*. When you think about art you have to consider who is making the work and *what they are making. So while there is much to know about the artist, we can take what we do know (little as that may be) and think about that within the larger context of the art world. Kindred to the abstract expressionist movement are names you probably recognize: Gorky, Kandinsky, Pollock, and Kline (all male and some slightly mad). As Taylor employs historically masculine aesthetics in her practice, we see her saying something about femininity in this field, and how it has a place of it’s own. And then we also see her saying something (or nothing at all) about age. “Lateral Movement”, mixed media on stretched bed sheet. Photo courtesy of the Clifton Cultural Arts Center. Blending found objects with labored handiwork, there is this naive sensibility in Taylor’s methodology to discovery. Utilizing the process of collage, the artist converges happenstance with rationale as it pertains to time and age and place and space. A bed sheet the backdrop, Lateral Movement showcases this playful disposition by way of late nineties ephemera and1960s floral print. This epoch extravaganza takes another spin in the time machine with a polished finesse of 80s grunge. The ubiquity of such dated iconography simultaneously ages the artist while misplacing her all the same. Her contrasting marriage of youthful gestures with modern appropriation yields a stylistically ambiguous composition. With overt references to the body, we can’t help but take the work personally. Through color choice and form, Taylor makes repeated nods toward the figure and its intestines, too. We see it in the pale pinkness of “No Ideas To Come” (below) and in the visceral nature of “Deconstruction” (not pictured). “No Ideas To Come”, mixed media on panel. Photo courtesy of Clifton Cultural Arts Center. We see it, too, in coy titles such as “Hear Here” accompanying, what else, but an ear. These formal components place her work within the confines of body art, only a little more removed and somewhat introspective. But it’s in this vein that we really begin to think about the artist’s hand in the work, which is a steering concept for this exploratory show. We begin to notice Taylor’s ownership of her work. We see how she changes the meaning of a piece through size, how the viewer resonates with content when the canvas is small but can identify with form at a large scale. 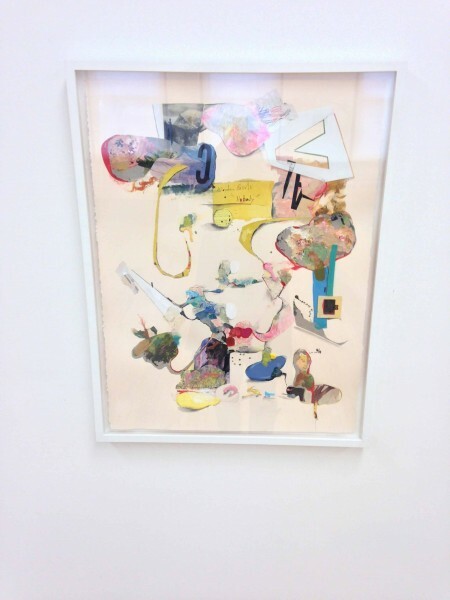 We see how she assigns or resigns meaning to her work through headings and irony. 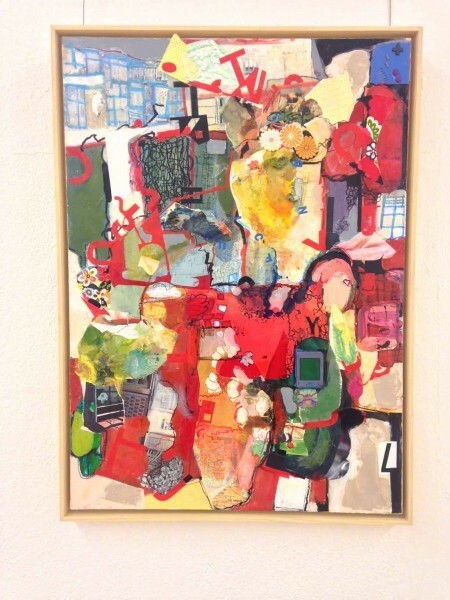 We see how she utilizes redundancy in her work to establish voice, repeating processes and aesthetics to ensure the viewer, even if they don’t know the meaning, knows her work. 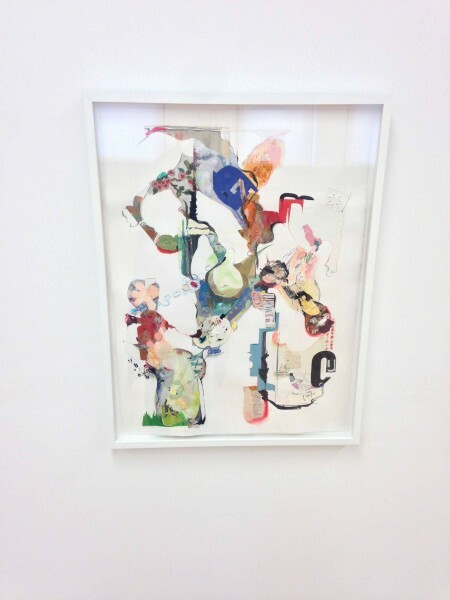 In spite of the seemingly varying content found within each of Taylor’s pieces, there is a repetitious quality to the body of work as a whole. While artists do inherit a style or develop a trademark, it’s not so much this sort of cohesiveness as it is a similar-ness. Take Nobody and Welcome Back Gift for example. “Nobody”, mixed media. Photo courtesy of Clifton Cultural Arts Center. “Welcome Back Gift”, mixed media. Photo courtesy of Clifton Cultural Arts Center. Paired side by side, we see two remarkably resemblant pieces. Reading as renditions of one another, the two feed off the use of negative space not only within their respective frame, but even more, from their counterpart. With such analogous features, the viewer now concentrates on the relationship between the two rather than each individually. This, I’ll assert, gets to the heart of this show. 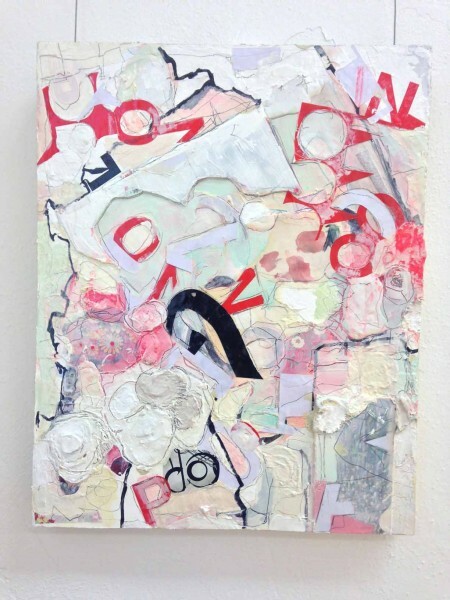 A self-described exploratory body of work, Taylor wanted to take us into her process. Exposing the very personal act of exploration, the artist showcases her journey rather than her destination. The reiterative nature of the work gives the viewer a sense of the artist’s experiential endeavor. 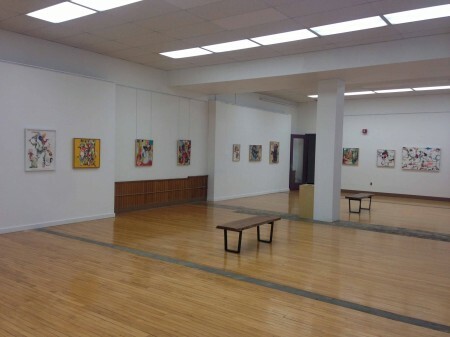 Wide shot of gallery. Photo courtesy of Clifton Cultural Arts Center. The ‘art’ of art truly is an undertaking. While most art-production takes place within a studio, the true maker flourishes within the gallery. While an exhibition opportunity can yield this sense of finality or conclusiveness to a body of work, it is really just the beginning of another stage within the art-making process. As we’ve watched the tides turn for what constitutes an art medium, extending far beyond the parameters of traditional, 2D, ‘fine’ art, we see the same happening for the operative role of a gallery. Designating so much more than a vocational milestone, the gallery serves a function in the reception of the work, meaning the how is of equal importance to the what. Concepts hang (literally) on the installation, the display, and the presentation of a body of work. This notion of ‘gallery’ turns exposition into experience, yielding a far more powerful tool to the artist. Residing somewhere between maker and curator, we find Kim Rae Taylor. Subscribing to traditional museum standards, we see her work presented in a historically conventional way; seemingly appropriate wall height and considerable spacing. But it was the constraints of these logistics that created a disparity between the concept and the display. To leverage the work conceptually, we needed the artist to really set the stage: To either invite us into the intimacy of her studio, or to indulge in physicality of the gallery space. But don’t take my word for it. See it for yourself at the Clifton Cultural Arts Center now through March 12, 2016.